Miscanthus is a group of ornamental grasses that make excellent perennials. They are clump forming plants with reed-like stems and leaves that are narrow and arch to the ground. The flower heads are puffy plumes that form in late summer to fall and make good cut or dried flowers. Most species are moderately frost hardy. 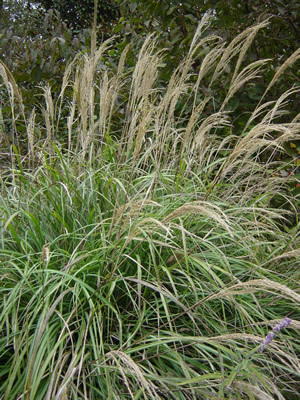 Miscanthus sinensis ‘Adagio is very similar to Maiden Grass but more compact in growth, reaching 2-3 feet in height.